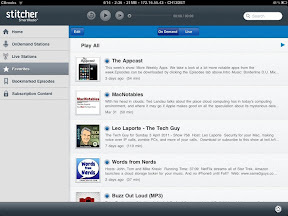 This is on of my favorite iPad app: Listner since May 26, 2008 with a total of 679hours and 25 minutes of podcast streaming. In fact it is my favorite Android and WebOS app as well. I have been waiting for the iPad version for nearly a year. The wait is over. Unless you've been under a rock for the last decade, you have at least heard of a podcast. It is an app that stitches your podcasts together so that you can have a continuous stream of audio for your podcast listening pleasure. Stitcher is calling it the "world’s first audio magazine", so I guess we will see more subscription podcasts. The app is Free and most of the podcasts are free too. 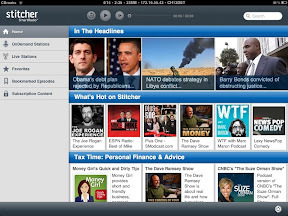 On April 13, 2011 Stitcher released its Stitcher SmartRadio iPad app marking a major milestone for them! Stitcher says "This new platform finally gives us the opportunity to unveil a creative vision made possible by the larger display tablets offer." What’s Hot: Listeners can follow the shows that are trending on Stitcher at any moment. Featured/New Shows: Listeners can discover shows related to current interests or popular culture events. Featured Lists: Listeners can see what celebrities – as well as the Stitcher community — are listening to with the new “What’s on your Stitcher?” featured playlist. Stiticher says that they have completely redesigned Stitcher’s homepage on the new iPad version of our app to make your listening experience visually exciting and engaging, while simplifying content discovery. And sharing episodes of your favorite shows with friends is now easier than ever. And it’s still FREE. Better yet, tell us your favorite shows during our upcoming What’s on Your Stitcher? contest for the opportunity to be featured on Stitcher’s iPad homepage. Look for more details on how to participate on our Twitter and FB pages in the coming weeks. I didn't waste time, I emailed Stitcher to add the ability to sort the lists by popularity, by recentlt release podcasts and more. 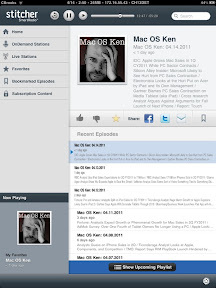 Get the FREE Stitcher Radio app for your iPad.